With night falling earlier, the peak commuting time coincides with deer coming out to feed on grass verges near roadsides. Because of this, SNH – in conjunction with Transport Scotland and Traffic Scotland – are placing warning messages on electronic variable messaging signs (VMS). From Monday, 30 October to Monday, 20 November, the signs will warn motorists at key locations on the main trunk roads. These messages will be seen on signs on the A9, A87, A82, A85 and the A835. 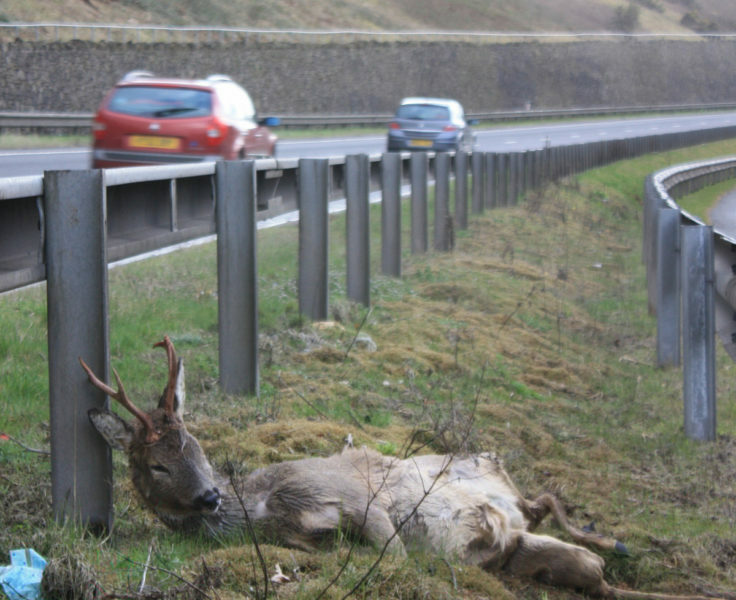 A report released earlier this year commissioned jointly by SNH and Transport Scotland revealed collisions between vehicles and deer have increased by 10% in Scotland since previous figures were collated. The report showed that from January 2013 to December 2015 over 4,600 recorded collisions between vehicles and deer on Scottish roads were submitted. However, taking into account the many incidents which go unreported, the report estimates that the true figure could be as high as 9,000 per year, resulting in 50 to 100 human injuries. The highest number of collisions occurs in early evening through to midnight, with a slightly lower peak from 6am to 9am. Over the past 50 years, the number and range of wild deer in Scotland have increased, while the volume of road traffic has almost doubled in the same period. This combination has led to higher deer-vehicle collision rates across the country, with the greatest increase occurring in Aberdeenshire, Fife and the central belt. This corresponds with the rise in the populations of roe deer, which are highly adaptable to lowland habitats. – Try not to suddenly swerve to avoid hitting a deer. A collision into oncoming traffic could be even worse. – Only brake sharply and stop if there is no danger of being hit by following or oncoming traffic. Try to come to a stop as far away from the animals as possible to allow them to leave the roadside without panic – and use your hazard warning lights. – Be aware that more deer may cross after the one or two you first see, as deer often travel in groups. – After dark, use full-beams when there is no oncoming traffic, as this will illuminate the eyes of deer on or near a roadway and give you more time to react. But dim your headlights when you see a deer or other animal on the road so you don’t startle it. – Report any deer-vehicle collisions to the police, who will contact the person in the area who can best help with an injured deer at the roadside. Do not approach an injured deer yourself as it may be dangerous.